Comfortable. Contemporary. Spacious. Tap into the rock star inside of you with a hotel experience that brings together quality and edge against the backdrop of mesmerizing views of Lake Tahoe. At South Lake Tahoe's newest and hottest casino, you don't have to go to the action - the action comes to you. With a 25,000 square foot casino floor, a William Hill Sportsbook and limits that match your mood; you're going to need a bigger wallet. Hottest Casino in South Lake Tahoe featuring more than 400 state-of-the-art video gaming machines and table games, including Blackjack, Craps, Roulette, Ultimate Texas Hold'em, Three Card Poker, Pai Gow and Baccarat. Our newest High-Limit Gaming lounge provides an intimate environment to let your rock star shine. 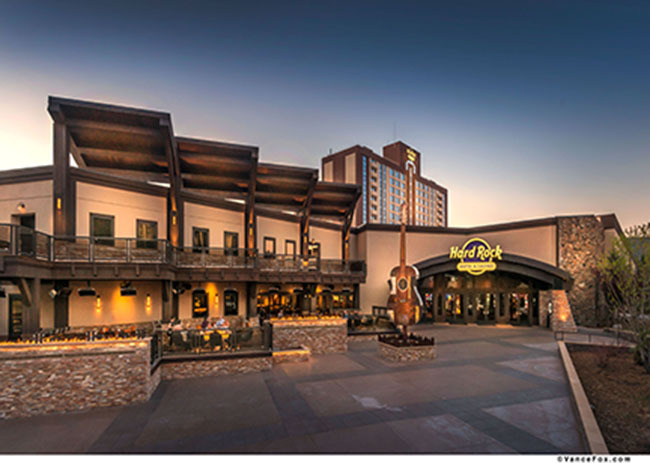 Surrounded by legendary rock n' roll memorabilia, the Hard Rock Casino provides elevated fun in a music-filled environment. Our engaging casino team makes every flip of the cards, roll of the dice or spin of the roulette wheel exciting. Be inspired to let loose. Alpine Union Bar & Kitchen - Inspired by the history that made South Lake Tahoe a destination. Take in the inspiration that brings us here year after year and enjoy your cabin comfortable dining experience with friends and family from near and far. American Fare meets rustic charm with locally-sourced options for breakfast, brunch, lunch & dinner. The Oyster Bar - Lake Tahoe's first and only raw seafood bar, we keep it fresh and delicious daily. Located in the heart of the Hard Rock Casino, The Oyster Bar is the destination for New Orleans favorites and oyster goodness. With an open kitchen, the talents of the staff and the freshness of its top-quality ingredients are on display. Park Prime Steakhouse - Park Prime is a modern steakhouse inspired by local ranchers, offering a sophisticated bar, live music, and stylish atmosphere. Providing upscale cuisine in a chic and comfortable atmosphere. The menu features dry-aged Prime beef from Harris Farms, premium seafood, shareable appetizers, an approachable wine list and specialty cocktails. Fuel - Our selection of fine dining and quick bite restaurants have the goods your taste buds are craving, so don't be shy about digging in. To complement the cuisine, our mixologists are shaking things up with signature cocktails served alongside both locally crafted and global beer selections - a perfect way to start or end your evening. William Hill Sports Bar - The Sports Bar is located adjacent to the hotel lobby and close to the property's sports book, promising to be a lively social spot featuring 80-inch LCD screens and an interactive video wall. Guests can choose from popular beers on draft and a selection of bottled beer and specialty cocktails.